Yummy snack which can be had even without any accompaniments. Finely chop green chillies, ginger, curry leaves and coconut. Grind the soaked dhal in a grinder to a smooth paste using very little water. The batter when dropped in water should float and that is the consistency. When smooth and slightly frothy, add salt, pepper and also the chopped items. Heat oil . Meanwhile, wet your palms with water, take out a ball from the batter. Carefully drop them into the oil and turn it on all sides and cook until golden brown. Serve hot with coconut chutney. Ensure medium heat of oil. If oil is smoking, the bondas will become red but will not be cooked. 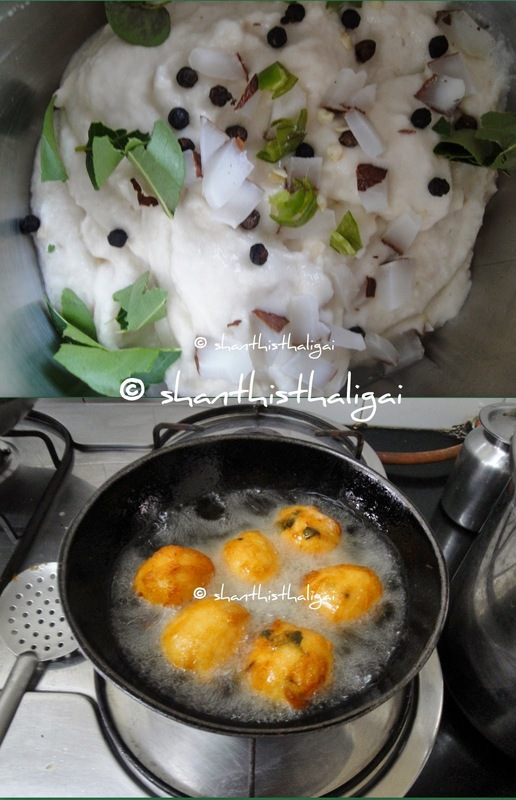 Wet your palms,or fingers for each bonda and the batter doesn't stick to your hands. Wow! I want to have this NOW!!! !